Editor/Author Farrell, Joseph and Putnam, Michael C. J. 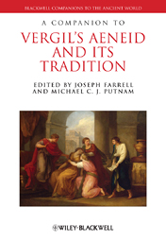 A Companion to Vergil's Aeneid and its Tradition presents a collection of original interpretive essays that represent an innovative addition to the body of Vergil scholarship. Provides fresh approaches to traditional Vergil scholarship and new insights into unfamiliar aspects of Vergil's textual history. Features contributions by an international team of the most distinguished scholars. Represents a distinctively original approach to Vergil scholarship.